If you are using a RefWorks account created on the "legacy" version (i.e., the account was created before September 1, 2016) you will have the option to migrate your account to the new Proquest RefWorks. RefWorks will contnue to support the legacy version through 2018 and possibly longer for those working on large projects like dissertations and books. But we also recommend that you migrate as soon as all prior documents are completed, not just to avoid retraining, because the new RefWorks has many new useful features that will not be provided in the legacy version. 1. Login to your legacy RefWorks account. 3. This takes you to the New RefWorks login and you will see your UPEI email address filled in. 4. Select a password to create your account and continue with the account registration process. 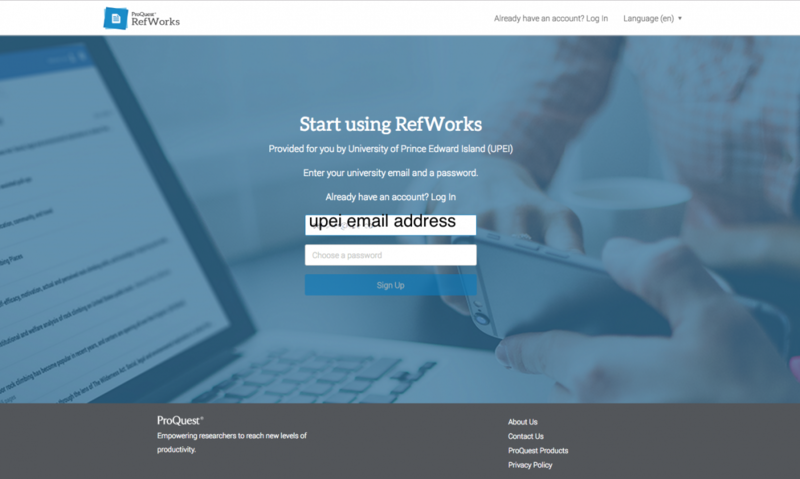 See the RefWorks Upgrade from Legacy RefWorks to the New RefWorks - User Guide (PDF) for more information. See the New RefWorks LibGuide for more information on using the New RefWorks.